We at Neurology, Psychiatry and Balance Therapy Center take an integrated approach to patient care by addressing our patients’ physical and mental well-being. Our team works with patients and their other healthcare providers to manage our patients’ health conditions effectively. We employ our clinical expertise, technology, and our ability to coordinate care across the healthcare disciplines to improve patients’ quality of life. To be the premier multidisciplinary center for treating patients with seizure disorders and dizziness. We will provide exceptional care for patients with general neurologic, psychiatric, and orthopedic conditions. We will excel at addressing both the physical and mental aspects of our patient’s conditions for their successful management. Neurology, Psychiatry and Balance Therapy Center is grounded in the Expertise of our founders, seamless Communication between the members of our patients’ healthcare teams, and Compassionate care for our patients. With years of experience and advanced training, we strive to stay current in our fields and provide informed, evidenced-based care. We read the latest literature, attend continuing education courses, and incorporate new technology into our practice when warranted. Communication is important to us and is vital for the effective delivery of healthcare. Through seamless interdisciplinary communication at our practice, we provide the most effective and coordinated care to achieve the best outcomes for our patients. We strive to extend that seamless communication to our patients and their healthcare team. We care deeply about the health and well-being of our patients. We understand the emotional and physical toll that medical conditions can take on patients and their families. We listen to our patients’ experiences and feelings, and we work each day to help them work through those issues. At Neurology, Psychiatry and Balance Therapy Center, we utilize state of the art technologies and equipment to assist us in determining accurate diagnoses for and providing our patients with the most effective treatments. BrainsWay Deep TMS (Transcranial Magnetic Stimulation) for Depression – Major Depressive Disorder is a highly prevalent condition which hampers a person’s ability to maintain relationships, a career and daily functioning. BrainsWay Deep TMS is an effective, non-invasive treatment which can help patients get their life back and regain calm and happiness. The treatment stimulates the brain regions responsible for depression using brief magnetic fields at an amplitude similar to that used in MRI technology. The therapy requires only daily 20-minute sessions over 4-6 weeks. BrainsWay Deep TMS has been proven to generate significant reduction of depressive symptoms, even in patients with severe, persistent depression, who tried several medications without improvement. The therapy has received an FDA approval, and is based on advanced patented technology. Best of all, BrainsWay Deep TMS does not cause systemic side effects. For more information on Brainsway Deep TMS click here. 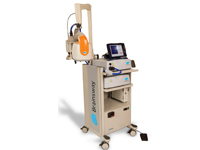 To see a video explaining Deep TMS therapy, click here. 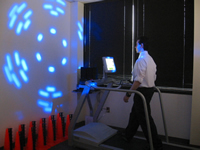 Computer Controlled Lights (Habituation Therapy) for Dizziness Caused by Environmental Stimuli – Some people get dizzy or lose their balance when they move. Others get dizzy or lose their balance when they see things move, even when they themselves are still. Busy environments can also cause dizziness. For instance, going to places like malls, busy stores, or the train station may trigger episodes of dizziness. These symptoms can often be treated successfully with a specific training technique call habituation therapy. 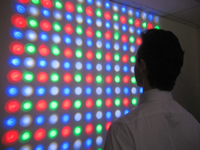 When we utilize habituation therapy to treat patients whose dizziness is caused by over stimulation, we incorporate a variety of computer controlled lights to carefully control patients’ visual stimulation. Over time, this allows us to decrease patients’ dizziness and improve their balance in busy environments and situations. 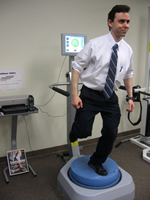 Computerized Balance Platform for Balance Testing and Treatment – Balance is very complex and difficult to measure precisely. That is why we utilize the Biodex Balance System SD as a tool to measure precisely how well our patients can control their standing balance under a variety of conditions. Further, our Biodex system can also be used to help screen for fall risks, as well as a diagnostic tool to help us understand how severely a patient may be affected by a concussion or other neurologic disorder. By using this system, we can easily track our patients’ progress with their balance. Just as importantly, the Biodex Balance System SD has many training programs that we utilize to help our patients improve their balance and muscle function caused by injuries. Dynamic Leg Press – The Shuttle Recovery is a dynamic leg press system that can be used to improve the strength and ability to control the legs, trunk, and arms. It can be used by people with a wide range of abilities. People with severe weakness can have their legs supported with a strap while working exercises to strengthen them. Athletes can use it to to work on muscle control during jumping activities. Click here to see videos of exercises using the Shuttle Recovery. Infrared Goggles for Vestibular (Inner Ear) Testing – Have you ever looked at your eyes in the mirror while moving your head around? If so, you may have noticed that no matter which way you move your head, your eyes stay fixed on their reflexion in the mirror. Our vestibular system in our inner ear is what causes this to happen. If there is a problem with the vestibular system, we can often tell by studying the eyes. We use infrared goggles to look at patients’ eyes while we are performing various tests. This helps us to see if your dizziness is caused by your brain your, vestibular system, or a specific part of your vestibular system. 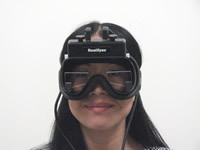 Click here to see a video of one type of eye movement, nystagmus, that we look for with infrared goggles. Overhead Rail and Harness System for Balance – One of the best ways to improve your balance is to challenge it! However, challenging your balance might be scary if you have a balance problem, and it could even be dangerous if it is not done in a safe way. That is why we use the MASS Rehab Rail and Harness. 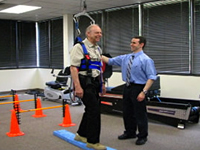 By wearing a harness suspended from a rail in the ceiling, it allows you to walk on the ground, walk on the treadmill, and to try challenging balance exercises without the fear falling. Doing this allows you to do exercises that will effectively improve your balance in a safe manner. To see how this works, click here to watch a video of the rail and harness in use. Please note that this is a simulation to demonstrate the safety and protection the device provides.